We are experienced paving contractors. We can install block paving to the highest of standards and at an affordable price. All our block paving installations are covered by our installation guarantee. 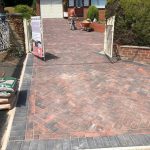 With options ranging from block paving, cobble stones, retro paving, Marshalls paving, Tegula paving, Driveline Paving and more. Call us today to book a free quote on installing block paving on driveways in Shropshire. We look forward to hearing from you.